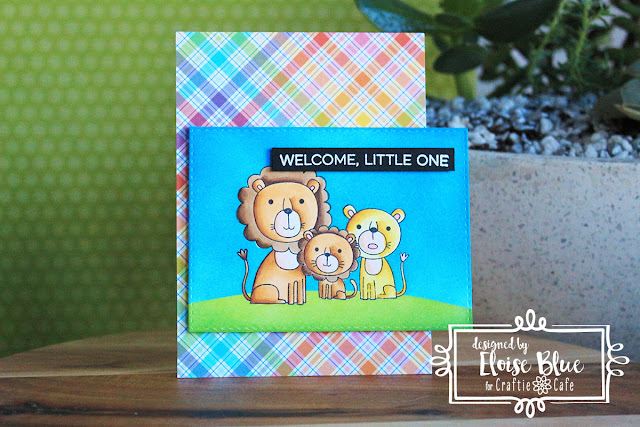 Hi everyone, today I'm here for Craftie Cafe and I have a new baby card to share with you all. I'll be using the Lion and Tigers stamp set by My Favorite Things along with the Essential Greetings stamp set also by MFT for my sentiment, since the Lion and Tigers set isn't aimed for baby themed cards. To begin my card today I first stamped three of my lion images onto some masking paper. I then fussy cut them out using some fine detail scissors. I then used a stitched rectangle die and cut out a piece of white cardstock. Then stamped the smallest lion first, added a mask on top, stamped the lion on the right, added a mask on top and then stamped the final lion on the left and added the mask over top. Then, I used another piece of masking paper, cut a hill shape and adhered it onto the bottom of my panel, underneath the lions feet. I then used Broken China, Tumbled Glass and Salty Ocean to blend the sky. Next I removed the hill mask, applied the negative piece of the mask and used Twisted Citron and Mowed Lawn to blend the grass. Once I blended my grass, I removed all the masks and used my Copic Markers to colour my lions. Now that all my colouring was done, I cut down a piece of Perfectly Plaid Rainbow Patterned Paper from Lawn Fawn and covered my card base. I then used foam tape along the back of my panel and adhered it horizontally onto a vertical card – there is a little over hang, but I like this look a lot better than on a horizontal card. 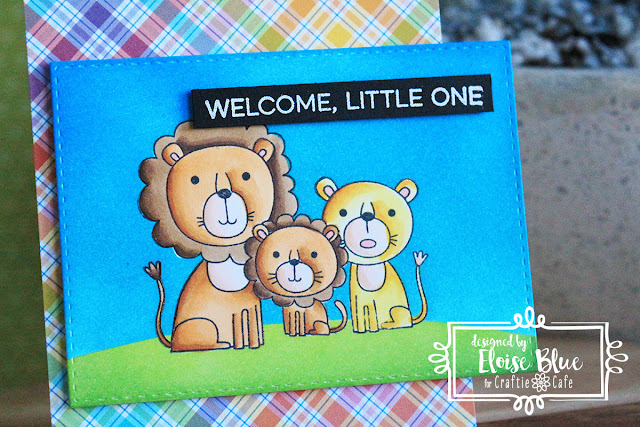 I then used the Essential Sentiments stamp set and white heat embossed ‘Welcome, Little One’ onto a thin strip of black cardstock. I then mounted that onto the top of my panel with more foam tape and that finished up my card for today. This card was super fast to make! Thanks so much for stopping by today, I hope you enjoyed.